The following pages show a few examples to better understand how things can be archived with the Pimcore targeting engine. All mentioned rules here are configured and set up in our demo advanced and can be tested there. The result of the ongoing profiling process is a set of target groups, that are assigned with a certain assignment relevance to the current visitor. So visitor profiling rules are always some conditions that result in assignment of an target group. If there is a document, directly associate this document with a target group. Like the page tenant switches is assigned to technical-guy target group. Every time a visitor visits that page, it gets the technical-guy target group assigned. Since one visit might be a coincidence, multiple visits might hint for a technical interest of that visitor. To filter out the coincidence visitors, a threshold can be defined at the target group. So not before the third visit, the target group is actually assigned to the visitors profile. Regular visits in a certain shopping category (e.g. football) indicate an interest in football. 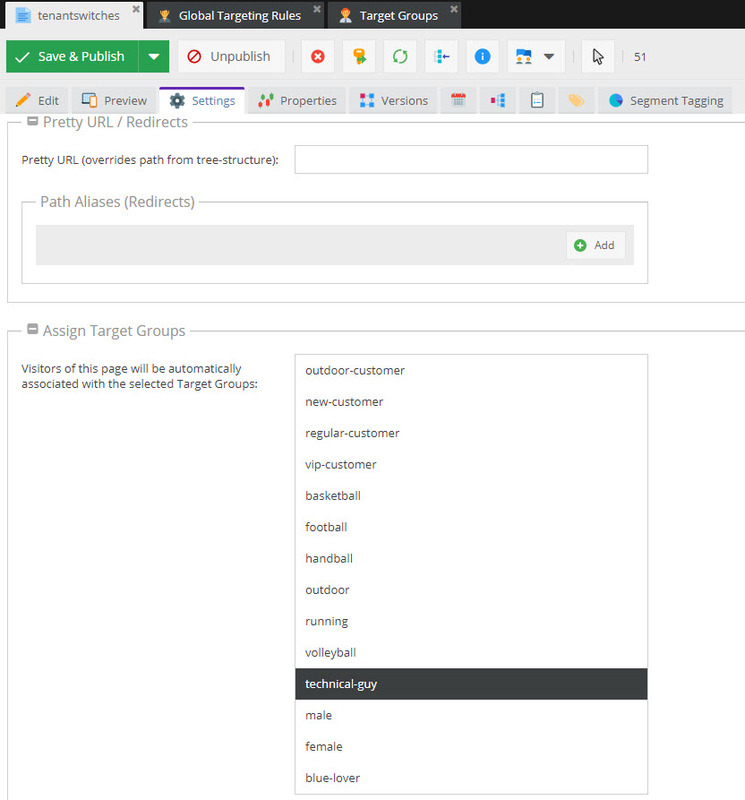 To track that information, add a global targeting rule with a URL condition and an action to assign the corresponding target group. To eliminate coincidence visits, e.g. an additional time on site condition can be added, like at the profiling_football targeting rule at the demo. The action should be executed on every request that matches the criteria - so use the scope Hit here. By doing so, the assignment count of the target group gets increased every time and so a certain relevance for the target groups can be identified - e.g. visitor is more interested in football that in basketball. Similar to the category interest tracking, customer characteristics like favorite color or even gender can be guessed. 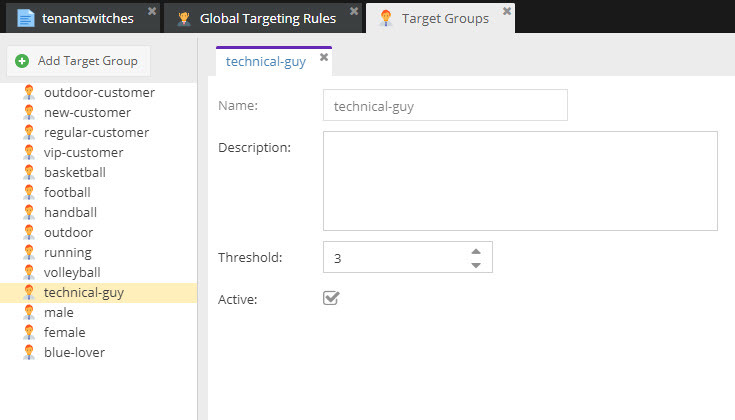 To do so, add for example a targeting rule that tracks product filtering for blue products and assigns corresponding target groups like the profiling_blue-lover rule does in the demo. In addition to collecting customer characteristics, you also could classify customers based on number of orders they made. For example once a new customer creates an additional order, it becomes a regular customer. See the profiling_regular-customer rule in the demo for details. In this case, it is important that the action is executed only once. Therefore choose Visitor as scope. These are only a few simple examples for visitor profiling with Pimcores targeting engine. One example for content personalization is to redirect a visitor to a special landing page that is answering this questions. 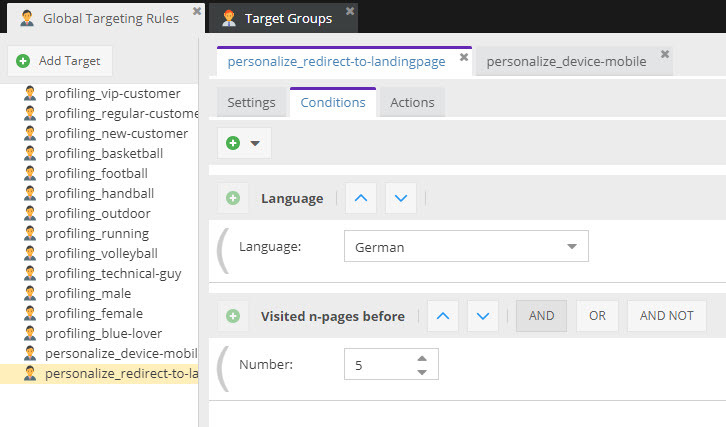 In our demo the example personalize_redirect-to-landingpage redirects visitors with language german that visited 5 pages on our website to a landing page. Of course this should happen not after every hit but only once per session, so scope is set to session. Another use case could be, that special users (e.g. mobile users from a certain country) should see a slightly different layout. 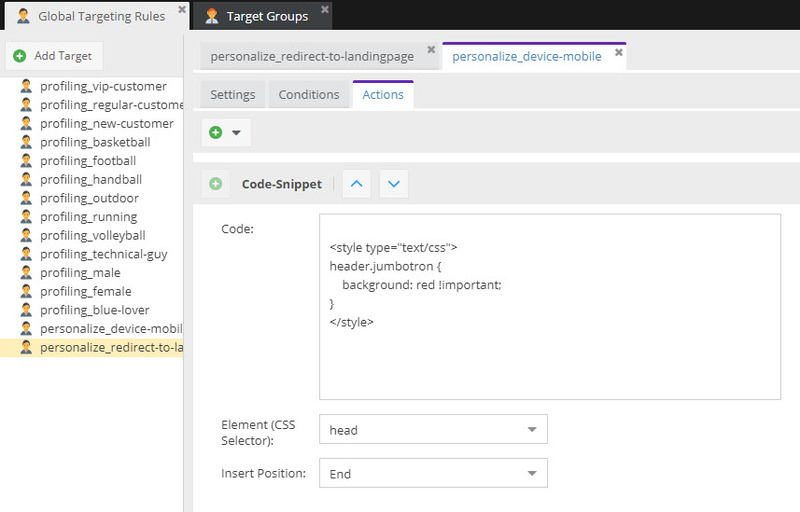 See the personalize_device-mobile rule of our demo how this can be archived by injecting additional CSS code to the page. The most common and most flexible way to customize content is to create customized variants of documents for certain target groups. See Create Personalized Content and Deliver Personalized Content for details. In our demo several different variants of the portal page are set up - e.g. 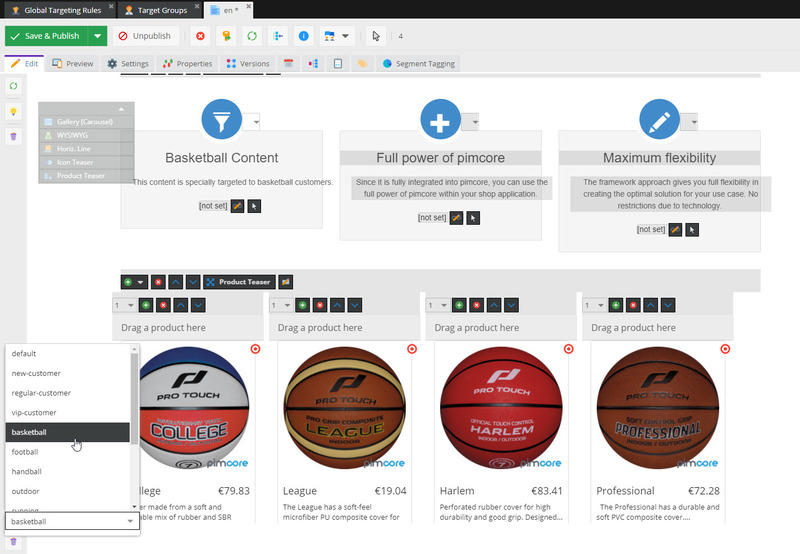 for target groups football, basketball, handball and others. Just try archive the corresponding target groups and see what happens.